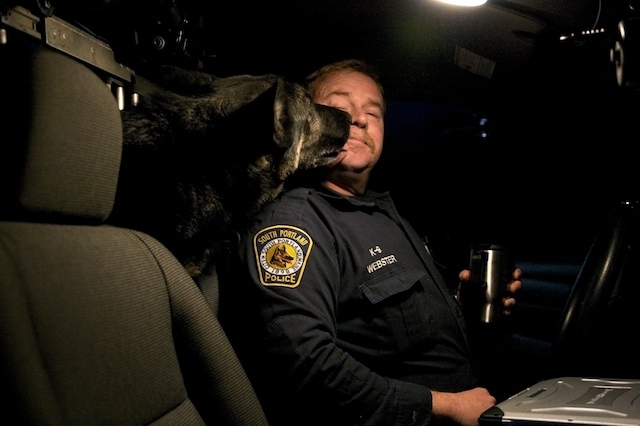 Officer Kevin Webster of the South Portland Police Department and K-9 Baron have been partners since March 2004. 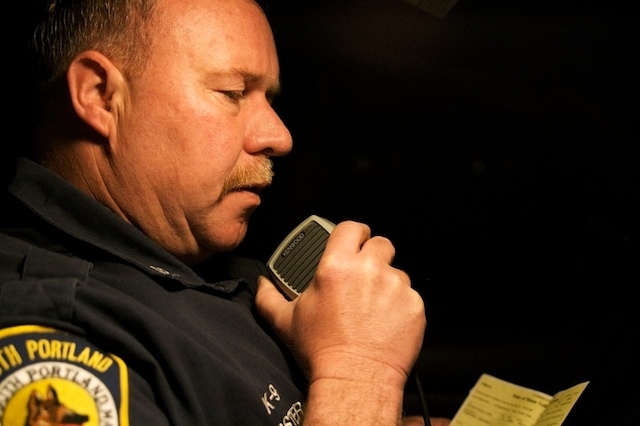 A police officer for 20 years, Kevin has more than enough seniority to work day shift but chooses to work at night when most K-9 calls come in. 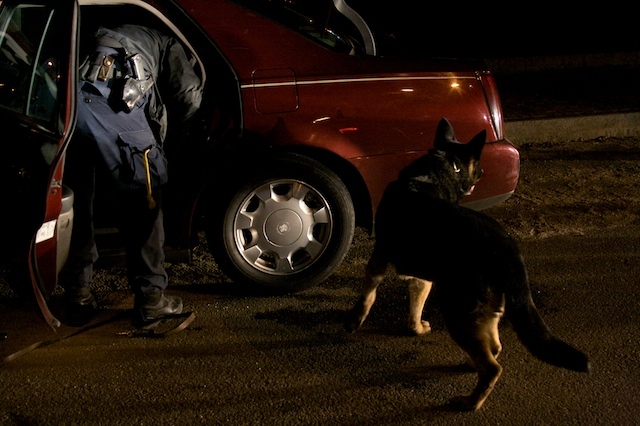 Kevin is convinced that Baron’s presence at his side frequently results in suspects handing over drugs or weapons without resistance or reconsidering any thoughts of fleeing the scene. 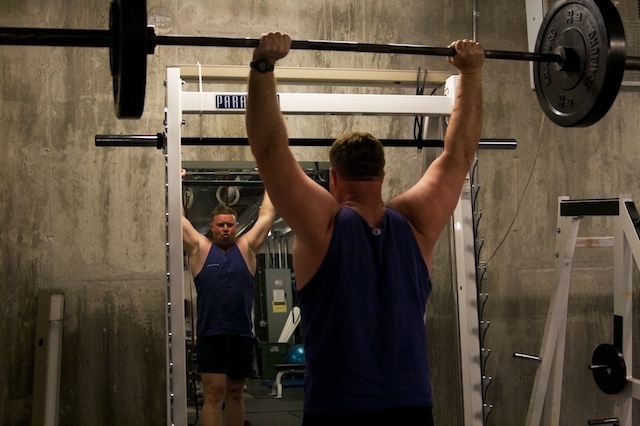 With the start of their shift still hours away, Kevin and Baron come in early for an afternoon training session. 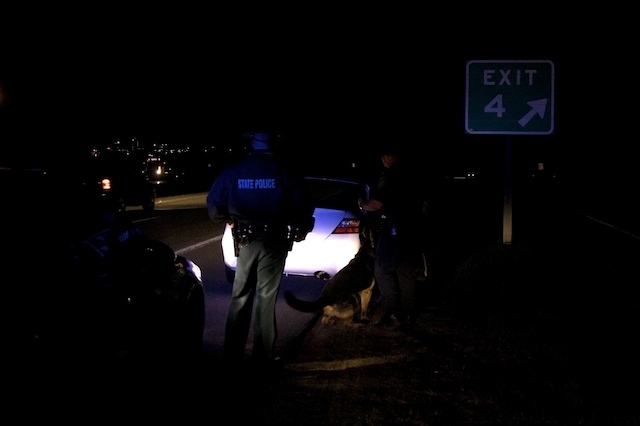 When dispatch gets a call from the Portland Police Department for a K-9 vehicle search, they immediately respond. Kevin must keep Baron under control at all times in challenging situations and provide clear commands to achieve desired results. When mistakes do occur, it’s always the K-9 handler’s fault. 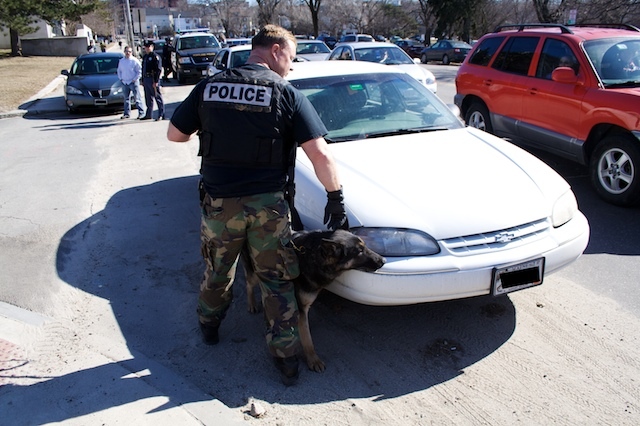 In 2008, 72% of the K-9 calls that Kevin and Baron answered were for illegal drug searches of vehicles, rooms, or persons. 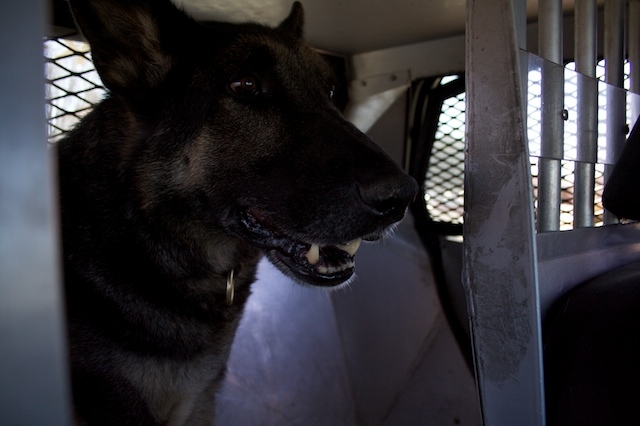 Baron is trained to find cocaine, heroin, marijuana, and methamphetamine. 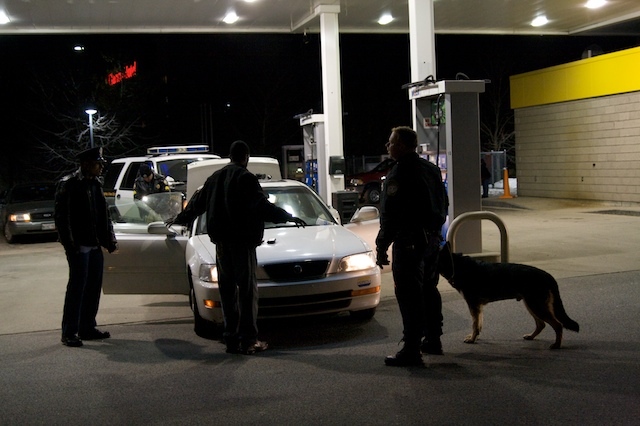 During the first four months of 2009, Kevin and Baron have already performed 34 drug searches, compared to a total of 60 the previous year, an increase that Kevin believes is due in part to the struggling economy. 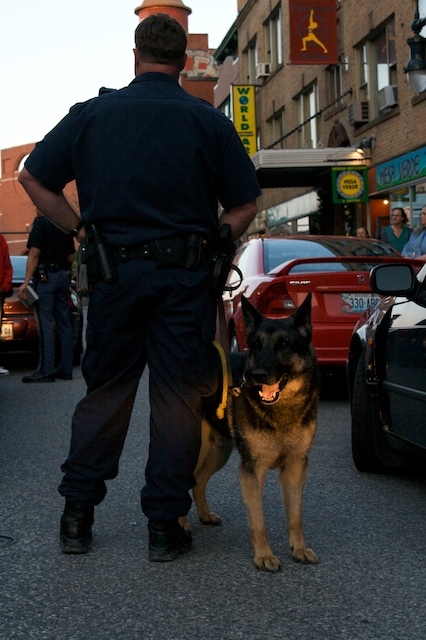 Kevin and Baron regularly conduct random drug searches at several treatment facilities for youth, as well as local middle and high schools. At Youth Alternatives Heritage House in South Portland, Baron takes less than 5 minutes to clear the four residents’ bedrooms and reassure staff no illegal drugs are hidden there. 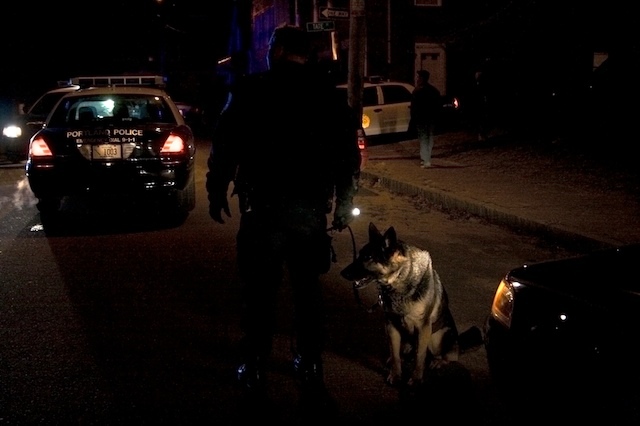 To become a K-9 handler at the South Portland Police Department, an officer must have at least 3 years of patrol experience before being eligible to apply. 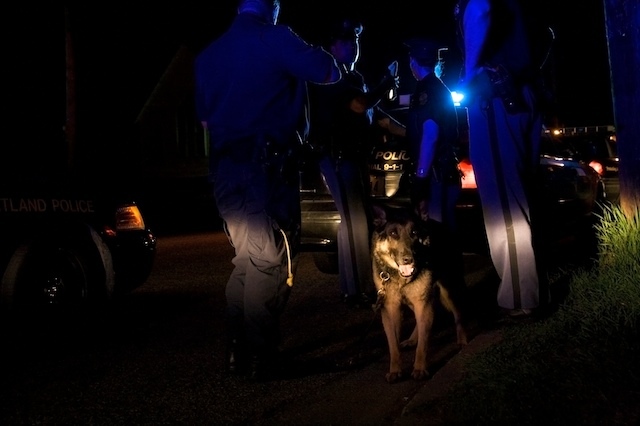 The responsibilities of a K-9 handler are in addition to all of the regular patrol duties that the officer must still perform. 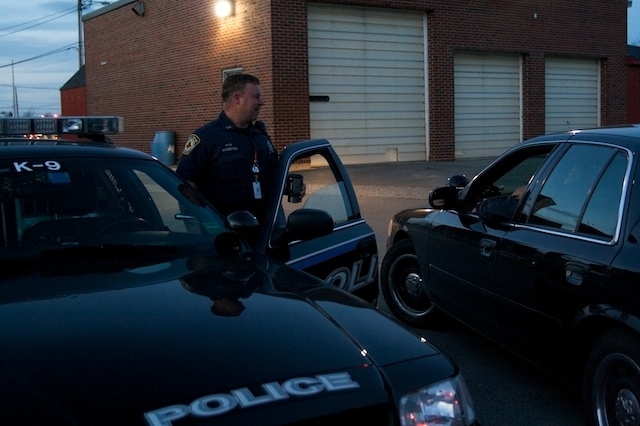 As members of the Special Reaction Team, South Portland Police Department’s version of SWAT, Kevin and Baron are called upon in the most high-risk cases, such as hostage situations. According to Kevin, the role of the K-9 team is to assist fellow police officers. Any drugs or other evidence that Baron finds are turned over to the officer on the scene who requested the search. 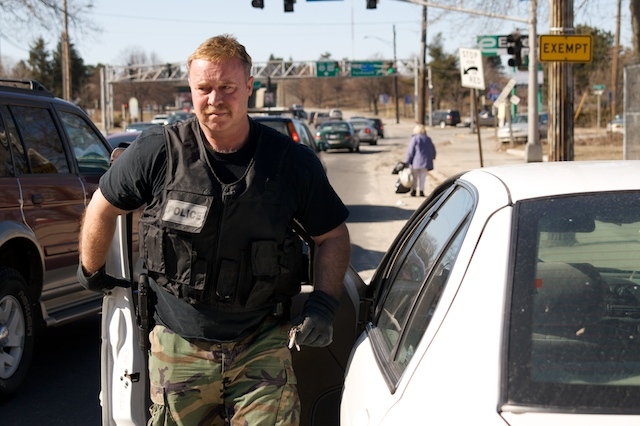 Kevin and Baron are often called upon to assist the Maine State Police, as well as the Maine Drug Enforcement Agency, in the Greater Portland area. Kevin has absolutely no doubt that Baron would do anything – even give his own life – to protect him if necessary. 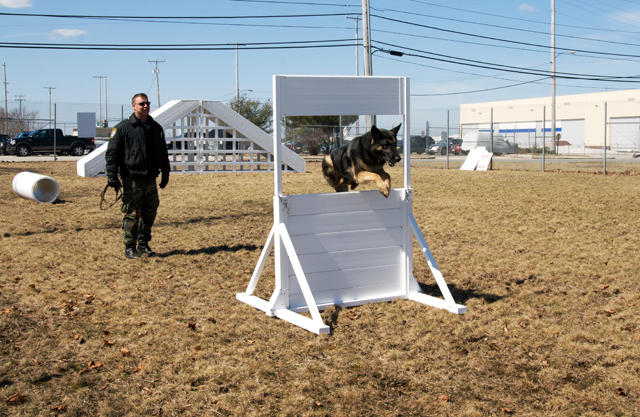 Police dogs must be highly motivated and truly love to work and are trained using positive rewards. For Baron, his reward is a favorite KONG rubber chew toy, and because he is, after all, a dog, it’s all a big game. When not on duty, Baron is just like any family pet. 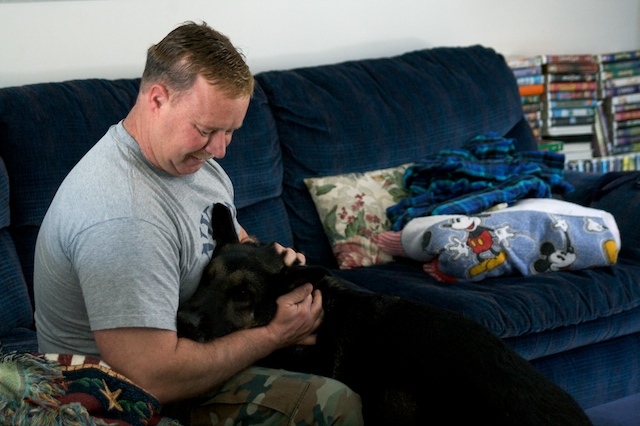 The 6-year-old German Shepherd lives with Kevin and his wife and two sons on a family farm in Windham. Off duty, Kevin spends many hours working on the farm with a year round list of chores that includes mending fences, cleaning out the barn, and bailing hay. A welcome change of pace from his job as a police officer, Kevin enjoys the fresh air, peaceful quiet, and the fact that there are no people to deal with out in the pasture. 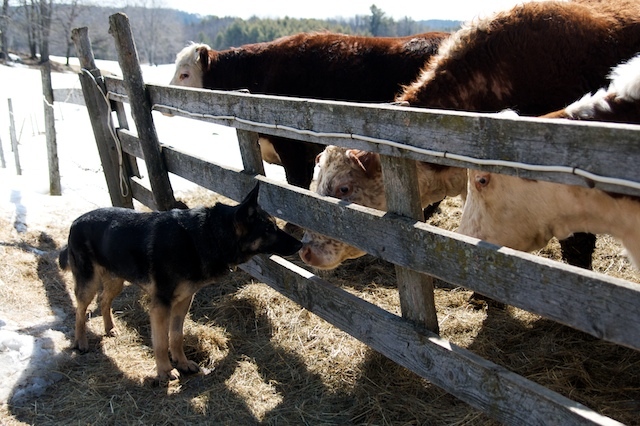 Baron, a European-bred German Shepherd from Holland, thrives as a police dog, as well as a Maine farm dog, and enjoys visiting with the cows every day. Recently recovered from emergency surgery to fix gastric torsion (bloat), Baron awaits his annual checkup at the South Portland Veterinary Hospital. Kevin, veterinary assistant Bethany Beote, and Dr. Christopher Allen of the South Portland Veterinary Hospital are pleased to see Baron back to full strength again. As a State Certified K-9 Trainer, Kevin devotes hundreds of hours a year to teaching and mentoring new K-9 handlers like Officer Kevin Gerrish. Since October 2008, Kevin has logged a total of 320 training hours with Officer Gerrish and K-9 Jerry, a 2-year-old Black Lab, in Explosives Detection. 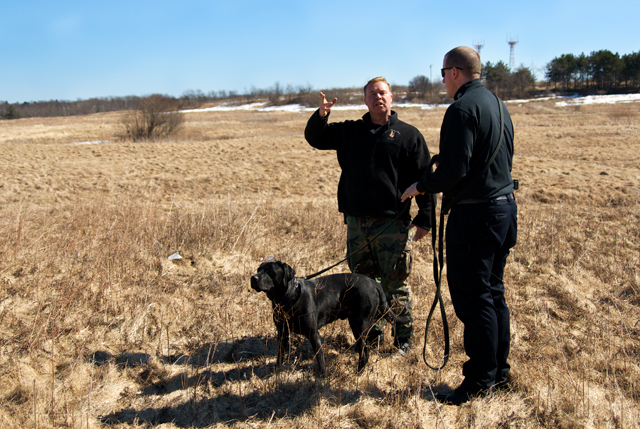 Officer Gerrish and Jerry complete the vehicle search portion of the certification exam for Explosives Detection under the watchful eyes of their trainer Kevin and Sgt. 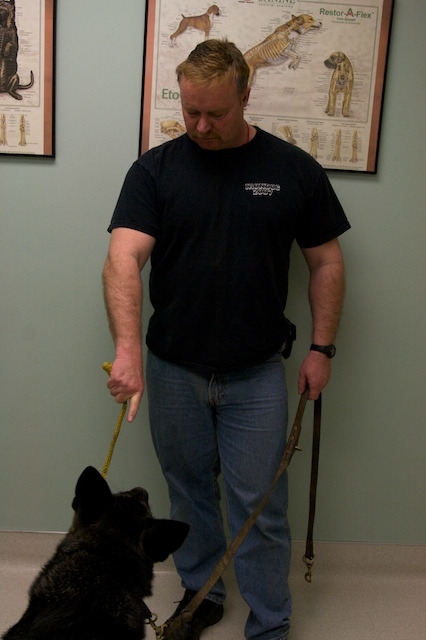 Michael Kaspereen of the Maine State Police, who is in charge of the K-9 training and certification program in Maine. Baron is certified in both Narcotics Detection and Patrol, which includes evidence and building searches, tracking, and criminal apprehension. 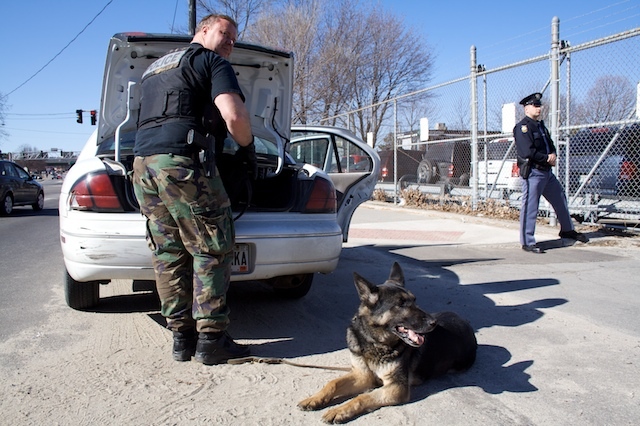 In order to be certified by the Maine Criminal Justice Academy, 8 hours of training time per month for each certification category are mandatory, and K-9 teams must be re-certified every 6 months. 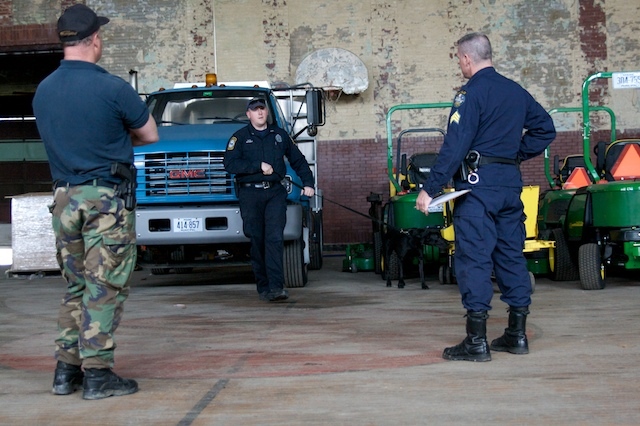 n building searches, often the dog is sent in first to locate suspects or clear the building as safe for human officers to enter. During a building search exercise, Baron barks outside the last door at the end of the long hallway to let Kevin know that someone is hiding inside. At Kevin’s command, Baron demonstrates his powerful biting ability, which is legendary among several K-9 handlers who have taken their turn inside the decoy suit.